There are parts of Wales that have had a Labour MP for 93 years since the fall of the Liberals and rise of Labour in 1922. So let's make a list of those unfortunate areas and perhaps highlight them with one of my maps. For a spot of fun, why not have a guess now as to how many there are and see if you're right at the end? Incidentally, my guess was seven. Our first port of call is wikipedia and the 2010 elections, for out of the forty current constituencies we can eliminate a slack handful right now by just getting rid of the seats that do not have a Labour MP. Fairwell to Aberconwy, Vale of Glamorgan, Preseli Pembrokeshire, Monmouth, Montgomeryshire, Cardiff North, Carmarthen West and Pembrokeshire South, Clwyd West, Dwyfor Meirionnydd, Arfon, Ceredigion, Brecon and Radnorshire and Cardiff Central. You're work here is done and you miss the final week of 'Labour Idol(ising)'. That was the easy part, next up we'll have to look through the list of constitiencies that do have a Labour MP and see how far back they go. Where the constituency has changed I will class that as a successor to the ones that went before it and look at those too. First up those constituencies with a Labour MP who aren't eligible for club 93. Those who can't be in our special club. 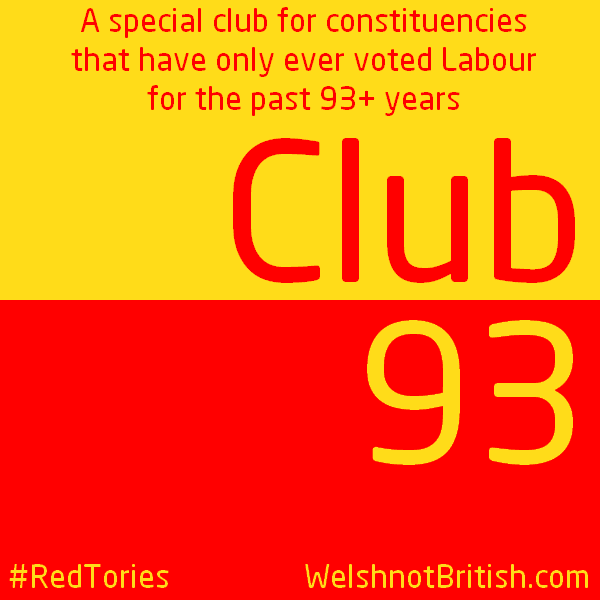 Cardiff West has only voted Labour since 1983 so it can't be part of club 93. Swansea West can only manage 51 years of Labour love, pathetic. Cardiff South and Penarth was only created in 1983 from two other seats and those in turn were created from other seats. Even if those had voted nothing but Labour (they haven't) it'd probably be too much hassle to look through them all. Newport West and Newport East were created in 1983 from Newport and they voted in three Tory MPs, (the blue ones) so they are not on the VIP list. Delyn and Bridgend were both created in 1983 and voted Tory, yawn. Clwyd South, a tiddler having only been created in 1997 from Clwyd something else and cosmopolitan Wrexham. Both of which clearly think they know better than to obey the Labour doctrine and send a message to London. Wrexham can only muster devotion since 1935, 80 years isn't enough respect to be taken seriously on this list. 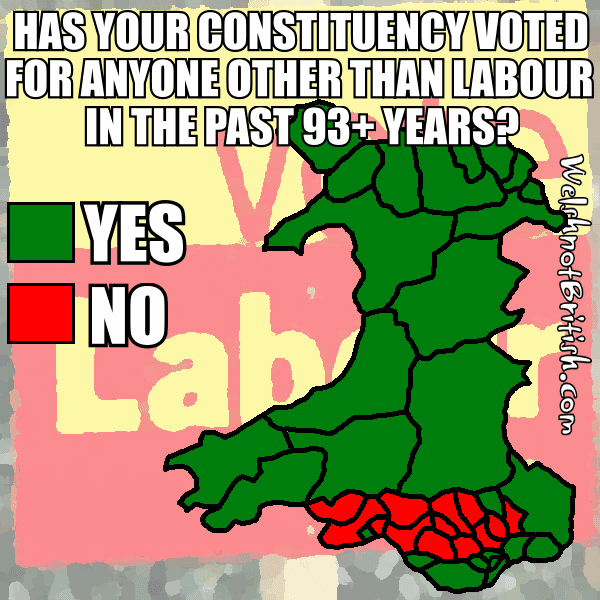 Ynys Môn has existed as a constituency since 1545 yet has only voted Labour since 2001. Pfft! Vale of Clwyd was created in 1997 from Delyn and a couple of other Clwyd's (big family). And we know they have a Tory tendency so they are not just off the list but barred from even looking at the list or looking through the windows. Blaenau Gwent, created from Ebbw Vale in 1983 and trounced on its fine Labour voting tradition by voting in independents not just once but twice in 2005 and 2006. They had 87 years until some drunken fumbles with Labourites posing as independents cost them a place in the club. After a stewards enquiry my decision to bar them was upheld by myself. Those who can be in our special club. Rhondda was created in 1974 from Rhondda East and West. Both of these fine settlements have shown their support for Labour since 1918. That's 97 years and counting. Gower has been a bastion of Labour support since 1910, a whopping 105 years of voting for the same party. Incidentally their first Labour MP was their Liberal MP at the previous election. Cynon Valley is a tricky one as it was formed from Aberdare but if we view it as one constituency then it has elected nothing but Labour since 1922. After a stewards enquiry Caerphilly was allowed into the club. It was felt that as they had been so faithful to the Labour party since 1918 we shouldn't blame them for the fact that one of their MPs defected to the SDLP in the early 80s. Especially when they replaced him with Labour as soon as they were able. 97 unbroken years of electing Labour, nice. 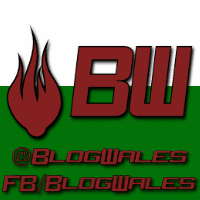 Islwyn was created in 1983 from Bedwellty, yep, as in Lord Kinnock of Bedwellty. Between the two of them they have managed 97 years of unbridled passion for Labour since 1918. Aberavon has managed 93 years of blind devotion and will surely continue this devotion when it's time to vote for the son of Lord Kinnock of Bedwellty, Stephen Kinnock. I looked at Aberavon in more detail here. Llanelli, the home of sospan has realised how great for its industry Labour are and have thanked them with votes since 1922. That's 93 years of love and I for one can feel it in the air. Was there any doubt about Neath? 93 and counting for this Swiss style millionaires retreat. I think we all hope that Peter Hain's replacement can do as fantastic a job for Neath as Peter has done for himself. Merthyr Tydfil and Rhymney was created in 1983 from Merthyr Tydfil and have an unbroken allegiance to the men in red since 1922. Whilst their MP Stephen Owen Davies did stand on an independent Labour ticket after Labour's Aberfan indiscretion he was still a Labourite and would have still been one had they not deselected him in favour of a younger, newer Labour candidate. I'm going to pull rank on this one and allow MT&R in the club with 93 years of support. If you can forgive Labour for Aberfan then you deserve to be in the Labour club. Who wants more? Ogmore does with 97 years of being faithful to the champions of the 'working man'. Swansea East, come on in. 93 years of Labour you say? Well done old boy. Torfaen 'evolved' from Pontypool in 1983 and between them they have managed to vote Labour since 1918. That's 97 years. Pontypridd almost blew it by voting Liberal in 1922 but saved themselves by voting Labour at the subsequent by-election when the incumbent got given a cushy job at the treasury. Up and under here we go, are you ready, yes or no? Up and under here we go it's the song of Pontypridd voting Labour for 93 years in a row. That's a freebie for you Max. By my count that's 13 seats out of 40 that have voted for one party for over 90 years. Regardless of who that party is, this is clearly unhealthy and entirely self-inflicted. Unless, of course, the streets of these parts of Wales are paved in gold, champagne flows from their taps and the youngsters from across the border flock there for work. Clearly that isn't happening and Labour are so entrenched in these areas that they could literally vote for more nuclear missiles, vote for Tory austerity cuts, not vote for a ban on fracking and not vote for Welsh resources to belong to Wales and people will still vote for them. I don't know what it will take to change the voting habits of some of these places but with one seat on 100+ years and three more likely to join it at this election and another nine at the one after that. Clearly no matter how poor Labour have watched Wales become in recent years, it is no where near poor enough for people to change their habits of not just their lifetime, but of their parents, grandparents and even great-grandparents life time. A Union rag on your driving licence?